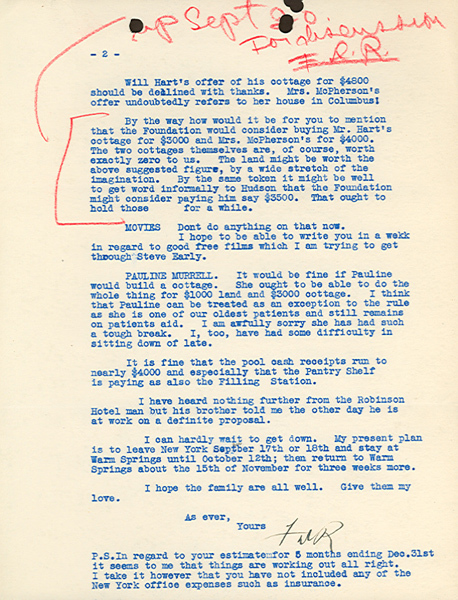 Typewritten Letter Signed, FDR, two very full pages, quarto, Hyde Park, August 10, 1929. As Governor of New York, to Carp. After thanking Carp for his letter, Franklin D Roosevelt notes that he is home for “three comparatively quiet days interspersed by only one speech each day before I leave on Monday for a tour through the southern tier lasting five days.” He then outlines his plans for “Farming Operations-I just knew that you as the descendant of a long line of up-state farmers like myself could not keep away from the soil. I think the plan of using the Williams property and Mose Martin’s an excellent one. 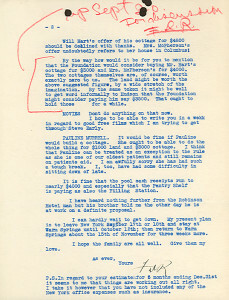 I would not change the obligation of the taxes from my name as yet, as it will be simply bookkeeping to have the Foundation buy back what I put into the property plus taxes and interest at the same time that the Foundation buys from me the Smith corner (Kibbe’s house) and the Colbert corner east of the pools. I am glad that you are getting on so well with the vegetable cellar in which to keep winter reserves. It is fine to think you are putting up so much in cans. In regard to the chicken farm, I think it is all right to help Leverett finance the Doster place and let him have the chicken yard, run, etc. on our property west of it providing the yards are not visible from the Foundation road to the west and providing we do not cut down a lot of trees. “Good for the goats! Between your goats and my bull we ought to teach these Georgians something about the use of mountain land. Will Hart’s offer of his cottage for $4800 should be declined with thanks. Mrs. McPherson’s offer undoubtedly refers to her house in Columbus. By the way, how would it be for you to mention that the Foundation would consider buying Mr. Hart’s cottage for $3000 and Mrs. McPherson’s for $4000. The two cottages themselves are, of course, worth exactly zero to us. The land might be worth the above suggested figure, by a wide stretch of the imagination. By the same token it might be well to get word informally to Hudson that the Foundation might consider paying him say $3500. That ought to hold those for a while.